When you’re looking to buy a bookbinding machine you may find yourself overwhelmed; there are a wide variety of options, and some of them are relatively similar. When you’re looking to buy a bookbinding machine you may find yourself overwhelmed; there are a wide variety of options, and some of them are relatively similar. Each type is best suited for different kinds of projects, and one may be a much better solution than another depending on your usage needs. Today we’ll go through some of the most common varieties. When your projects are legal sized, straight out of a box, and only up to an inch thick, a velobinder may be your best bet. Velobinders have a variety of functions, which makes them a good option if you need versatility. When using a tape machine, a strip of adhesive is used to bind the edges of the pages together. This method is useful and cost-effective, but it can be less effective if misused. Often used for professional documents, thermal binding creates a clean, well-kept appearance. This method uses a pre-glued spine which is heated until the glue melts after the pages are inserted. Strip binders use strips inserted through holes punched in the paper, and then they apply heat to secure the insertions for a tight finish. Coil binders wrap a series of wires through the holes to form a bind. This method is perfect for larger documents, which sets it apart from many of the other options. Coil machines also make use of the hole punching method. However, in this case, plastic coils are inserted into the holes to form a binding. Because this binding method produces durable results, it’s an excellent option for documents that will see regular use. 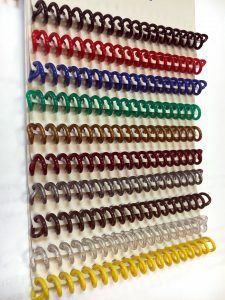 If you’re looking for a simple binding method for smaller books and documents, a comb binding machine is a perfect fit. Comb binding machines punch holes into the paper and then add a comb that can be manipulated to add or remove individual pages. Advantage Book Binding Can Help You Create the Printed Book You’ve Always Wanted! Are you interested in having a bound novel? Are you entering the workforce, and need a bound portfolio to showcase your work? Advantage Book Binding offers plenty of services and binding types that are perfect for suiting your needs. We also offer specialty binding options for those of you looking for something extra special. Advantage Book Binding can advise you as to what kind of binding style will work best for your specific project, taking into consideration budget requirements to provide you with the most cost-effective and project-specific solution for you. Please contact us today for more information, and keep up with us on Facebook, Google +, Twitter, and LinkedIn. Also, don’t hesitate to visit us at our Baltimore headquarters.